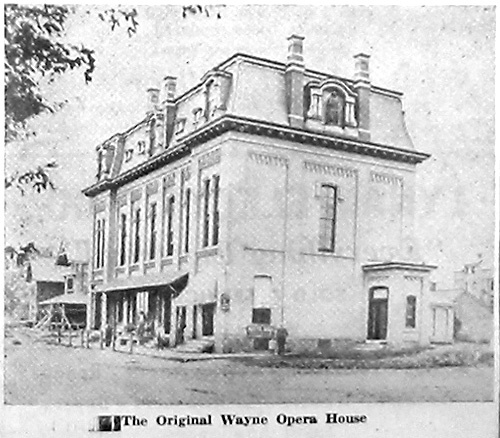 And with its cornerstone laid seventy-nine years ago on the afternoon of July 4, 1871, and with its dedication on Tuesday evening, October 24, of the same year, it may well be called “an historical landmark” of Wayne! That first small square building as pictured in this article is very different from the present edifice with its rambling additions made by the Wayne Estate in 1903 to provide quarters for the post office and with the alterations that followed the disastrous fire of 1914. Located at the northeast corner of Lancaster Pike and North Wayne avenue, this building, known originally as Wayne Lyceum Hall, was built on ground given by J. Henry Askin, one of the founders of Wayne. Mr. Askin resided in Louella House, the beautiful home on Lancaster PIke which is today known as Louella Court Apartments. The picture which we are using in this column was taken probably in the early eighties, from a position near the middle of the business block on the south side of the Lancaster Pike. The mansard roof with the figure of “Charity” in the niche between the two chimneys has since been removed and the addition to the west has been added. The scaffolding to the left of the picture is for the large porch then being built to face south and east onto the residence which belonged at that time to Mr. and Mrs. Christopher Fallon. Later it was purchased by Lizzie Pugh Fronefield. The front part of the building was a residence while the back part facing on North Wayne avenue housed the Post Office. At a later period the wide porch facing east was removed and the part of the porch facing south was incorporated into the building itself. After some years the post-office was moved from this location and the former residence was remodeled into two stores, one on Wayne avenue and the other on the corner. After some modernization done about a year ago the corner property is now occupied by Cobb and Lawless while to the north is the fish market, now operated by Robert Resester. About a year ago extracts from some memoirs of Mr. Fronefield were published in “Your Town and My Town”. In these memoirs Mr. Fronefield described the Lyceum Hall just as it must have been when this picture was taken. It was, he says, “a plastered mansard-roof house of a dull-grayish brown color, occupied on the first floor by a general country store which sold dry goods, groceries, hardware and farming implements, under the proprietorship of J. Harry Brooke, who many years afterwards was real estate officer of the Merion Title & Trust Company. Mr. Brooke, his clerk, and the writer occupied the green room and stage wings of the auditorium on the second floor for sleeping quarters. More than once my cot and rug were used for stage decorations at the time of concerts. There were “introductory remarks” by the president of the Lyceum, J. Henry Askin; a prayer by the Rev. J. H. Watkins; singing of a song “Sunny Hours of Childhood”; a congratulatory address by Miss Lizzie Heysharn and again a song, “Our Meeting.” The dedication of Lyceum Hall was made by Miss Mary C. Everman, secretary of the Lyceum, followed by a dedication prayer by the Rev. C. B. Oakley. “Popular Education” was the topic of a talk by Miss Sallie B. Martin, who directed the Wayne Lyceum School which was held daily. Then a thirty minute intermission refreshed the audience for two more songs, “Minute Gun at Seat” and “Sleighride Song,” which was followed by the closing address made by the Rev. A. L. Wilson. All of the addresses, quaint in their wording to present readers and at times pompous as well, are yet full of real feeling occasioned by the completion of a great project carried out by a generous donor, J. Henry Askin. “We comprehend and appreciate this gift of love” according to Miss Everman, in her dedication, “when we contemplate the pleasant gatherings, the intellectual strength attained. Here will the cultivation and development of the mind be produced, which shall not only affect and benefit those who are permitted to congregate within these walls, but its influence shall be felt in generations hence, when scattered here and there upon life’s tempestuous sea. The building is described as “built of brick, rough cast in imitation of granite, three stories high, forty by eight feet in dimensions. The first floor contains two large stores, each 20 by 40 feet, and an office the same size. the other room on the same floor (the reading and library room of the Lyceum) is 15 by 40 feet. “The second floor of the Lyceum Hall is 55 by 40 feet. It has a gallery and a stage with rooms for the president and secretary. A beautiful painted curtain representing “Wayne Hall” of blessed memory and the spring house to the south of it was painted by Mr. Chase, scene painter of the city. The Hall is well lighted with gas, and painted in oak and walnut. The back and side of the stage and the rooms are handsomely papered. Beyond any doubt it is the best arranged and the handsmest Hall in the County. “The third floor is being finished as a Masonic Hall and is intended to be used for a new Masonic Lodge. It is rather larger than the Hall on the 2nd floor on account of having no stage, and will seat, if fully occupied, at least six hundred people. It is at present receiving the last coat of plaster. Almost eighty years later the list of those who did work on Lyceum Hall or who furnished materials for its construction is a nostalgic one. David S. Gendale, Esq., was the architect; Duncan and Richardson were the carpenters; Capt. O’Byran, the master platerer; John Campbell, the bricklayer; Mahlon H. Rossiter, the stone mason; William Anderson, the marble mason; Thomas Wolf, the painter and glazier; James Mayhood, the tinsmith and roofer; W. Walter, the slater; W. Edwood Rowan, the paperhanger; Mr. Rusi, the upholsterer. Bricks were furnished by Messrs. Gygar and Carroll; marble by Adam and Don; stone by the Wayne Quarries; carpets by the Messrs. McCollum, Sloan and Company; furniture by Mr. Buckley; iron work by Samuel J. Creswell, Jr.
During the past weeks the historic part of our present neighboring suburb of Strafford has been recreated in many of its picturesque aspects for our readers, through descriptions of the old Spread Eagle Inn and the settlement of Siterville, which grew up around it. Much of the historic interest and importance of our locality centers around this old settlement, the name of which came from early owners of the Inn, the Siter family, whose descendants later became large landowners in Radnor township. As the Pennsylvania Railroad increased in importance, travel along the old highway gradually decreased and the importance of even the finest of the old wayside inns, such as the Spread Eagle, diminished until many of them fell into disuse. The first station of the Railroad to be located in the general vicinity of old Siterville was known as Eagle Station, which in its original form is remembered by only a few of the oldest residents of Strafford. Among them is Martha Wentworth Suffren, to whom the writer is indebted for her information on Eagle station which, as explained in last week’s column, took its present name of Strafford from the family estate of Mrs. Suffren’s parents, Mr. and Mrs. John Langdon Wentworth. The old station stood near a grade crossing about one-third of a mile west of the site of the present Strafford station, at a point where the old Lancaster road crossed the two-track line of the Pennsylvania Railroad. The building Mrs. Suffren describes as a substantial one, built of brick and two stories in height, the lower floor divided into two rooms. The one on the West side served as the passenger waiting room and was heated by a coal stove. The Eastern room housed the express office, the telegraph office and the “Spread Eagle” Post Office, all presided over most efficiently by Miss Annie Bloomer. A few feet to the west stood a large stone house built in 1762, where for many years Mrs. Miflin Lewis, her daughter, Louise, and another daughter, Mrs. Rush, ran a very successful boarding house. At present this is the home of the Rosato family. At one time an uncovered bridge extended from the second floor of the boarding house to the second floor of the station building, showing that the upper floor of the station was used as an extension to the boarding house. A few may still remember the Lewis boarding house, where many prominent Philadelphia families summered in the days, now long past, when it was noted for its abundant and delicious food. Before the introduction of the Springfield water system, all the water for use throughout the large house came from a pump that stood in the yard between the station and the boarding house. This water was pumped and carried by a squat and elderly colored man known as “Old Charlie”. Near the pump stood a Paulownia tree which cast its blue flowers over the ground in the late Summer. The Spread Eagle Post office took its name form the Old Inn which was about a third of a mile east of Eagle Station. The four-tracked road replacing the two-tracked one as far as Devon was finished in 1886. This meant doing away with all grade crossings, including the one at Old Eagle Station. Since it was impossible to tunnel under the railroad there, due to the steep upgrade, ground to the East was bought from Mr. Wentworth. This allowed for the necessary tunnelling. After World War I, the grade of the Old Lancaster road, west of the former grade crossing, was lowered three feet as part of a WPA project. Strafford Station in its present form is a relic of the Philadelphia Centennial Exposition held in 1876, where it was originally known as the Japanese Building. Built by Japanese workmen, it was put together with wooden pegs instead of iron nails. When the Pennsylvania Railroad first bought it at the close of the Centennial, they placed it at Wayne. However, in 1887 it was moved westward to Eagle, after the Drexel and Childs real estate development made a larger station at Wayne imperative. Soon thereafter the name of Eagle was changed to Strafford. Mrs. Suffren also tells an interesting tale of the naming of Daylesford Staiton, which centers around one Warren Hastings, an Englishman born in 1732, who 18 years later went to India, where he took employment in the famous East India Company. In recognition of his efficiency he was appointed Governor General of British India in 1774. His rule, while severe, was a just one, which however, brought impeachment proceedings against him by Edmund Burke. He returned to England, where his trial dragged out until 1795, when he was cleared of all accusations. however, he had spent all his fortune in his defense and in consequence was penniless. With an annuity for life from the East India Company, in addition to a large load, he bought an English estate which he named “Daylesford”. One of his interested friends in the United States was Richard Graham, who had bought a large tract of ground near the present station of Daylesford. When the railrad sought a name for its new station Mr. Graham suggested Daylesford, in honor of his friend. And by that name it is known today. Probably no one is better qualified to discuss Strafford of an earlier day than the delightful little gray haired lady now almost ninety-two years old, with whom the writer had the pleasure of talking one afternoon last week. As the train outside beat against the window panes in an almost torrential downpour we sat in her quiet living room as Martha Wentworth Suffren told of a childhood spent in the old Wentworth mansion still standing on the hill on the right of Homestead road as one turns to the left from Old Eagle School road. Built in 1856 by the White family of Philadelphia, this spacious home, with its ceilings constructed 13 1/2 feet high for coolness and ventilation, was bought in 1857 by Mrs. Suffren’s parents, Mr. and Mrs. John Langdon Wentworth, who were living at the time in an old inn in Paoli, kept by one John Evans. Since the Whites could not, in the end, finance the large home which they had undertaken to build, it was sold to Mr. Wentworth under “mechanics liens.” The latter, in looking for a home for his family, was touring the country roads in this vicinity when the large sign advertising the place for sale attracted his attention. Here he and Mrs. Wentworth raised their three daughters. In addition to Mrs. Suffren, the daughters are Mrs. Foote, now residing in Garden City, New York, and Mrs. Charles Ruschenberger, who died a few years ago. The latter was a charter member of the Saturday Club and prominent for many years as a member of other community groups. The Wentworth place, with its spacious home surrounded by its 130 acres, gave its name to Strafford Station, formerly called Eagle Station. Although a little reluctant to give his consent to the use of the name, Mr. Wentworth finally did so since the Pennsylvania Railroad was anxious for a word of two syllables which could be clearly called out by conductors! Martha Wentworth Suffren recalls a quiet childhood when “the seasons were her clock.” There was strawberry time, raspberry time, peach time, apple time, chestnut time. The latter she remembers especially because it was then that “the children had to ge up early to beat the turkeys.” As the latter started from the barn they described a complete circle of these trees that brought them back to the barn again at sundown. As the bushes and trees blossomed and fruited, the small girl picked the ripened fruit as she made her quiet rounds of her father’s farm. In winter she attended a school frun by Miss Anna Markley and Miss Anna Matlack. The school moved from time to time to various locations “which made it exciting,” according to Mrs. Suffren! She finished her education by extensive reading, of which she was naturally fond. In 1880, Martha Wentworth marries Charles C. Suffren and moved away from Strafford, not to return until 1920, when she occupied the home on Homestead road which she and her husband had built in 1909. Here she has lived ever since, just a short distance from the house in which she was born in 1858. It is now the home of E. Brooke Matlack. Of the old Spread Eagle Inn, of which we have written recently in this column, Mrs. Suffren recalls that the last owner before Mr. George W. Childs was a Mr. Crumley. When it was occupied as an Indian School as described in last week’s column, this school was run by mary McHenry Coxe, wife of Belangee Coxe. Its purpose was to teach good housekeeping methods which Indian girls might impart to other members of their tribes upon their return home. Before the old Inn was destroyed for stone for the new houses and roads that Mr. Childs was building in Wayne in the late eighties and early nineties, it was occupied by workmen from the Wayne Estate building operation. The present Spread Eagle Mansion, which takes its name from the old Inn, was built some years before the destruction of the latter. It has had many occupants, of whom the writer hopes to learn more and to tell about in this column. Mrs. Suffren remembers particularly the John B. Thayers, who bought the place in about the middle sixties. There were six children in the family, among them John B. Thayer, Jr., a vice-president of the Pennsylvania Railroad who lost his life in the sinking of the White Star liner “Titanic,” at that time the largest ship afloat, when it went down in 1912 after a collision with an iceberg. The small white house to the West of the Spread Eagle Mansion which is now occupied as a Beauty Salon was once a toll house, Mrs. Suffren tells us. A that time a room that just touched the Lancaster Pike was the vantage point from which tolls of three cents per vehicle was collected by the woman in charge as she lifted the long bar that extended across the road in order to let such vehicles pass – a procedure rather difficult to imagine in this era of the fast moving motor vehicles. An interesting correction on the story of the big oak still standing in Strafford to the north of Lancaster Pike and described in a recent column as a “lookout tree” has come to me from L. E. Davis, of Weadley road, in Strafford. This lookout tree, according to Mr. Davis, was a giant chestnut over six feet in diameter and about seventy-five feet high. This “Signal Tree,” of which Mr. Davis still has a piece, was taken down when Sigmund’s drug store at the intersection of Lincoln Highway and Old Eagle School road was built. The next signal tree was just at the top of the hill north of the Doyle Nurseries. The interesting story of these historical trees was told to Mr. Davis by his grandfather, who died in 1906 at the age of 88. The latter’s son, still living at the age of 85, can also remember these trees. When the big chestnut on the Pike was taken down to make room for the building of the drug store, it was rescued from burning by Mr. Barr, of Phoenixville, who still has much of it stored in his barn. Out of parts of it he made boot jacks which were sent to the museums of a number of large American colleges. From time to time various members of the Siter family, of which there are still descendants in Wayne, were associated with the Old Spread Eagle Inn. It was in 1825 that Edward W. Siter became owner of that famous tavern, and remained its landlord until 1836 when Stephen Horne, who had been associated with the place for some time, leased the Inn. Two years before this a most exciting incident occurred in the vicinity of Siterville, as the small settlement around the Inn had come to be called. The excitement was caused by the descent of James Mill’s balloon, which had started from Philadelphia at half past five in the afternoon and some two house later had descended in a field near the Inn. “Warned by the increasing obscurity of the world below, I began to descend and at six o’clock and 20 minutes reached the earth in a fine green field, near the Spread Eagle Inn on the Lancaster Turnpike, 16 miles from Philadelphia. As I descended very slowly, two young gentlemen and Dr. M., of Philadelphia, came ot my assistance, and laying hold of the car in which I remained, towed me about a quarter mile to the tavern, where I alighted, balloon and passenger safe and sound. “Before discharging the gas, several ladies got successively into the car and were let up as far as the anchor rope would permit. The gas was let out and the balloon folded. In doing this a cricket was unfortunately included, and having to cut his way out he made the only break in the balloon which occurred on this expedition. A far cry indeed to the days, only some hundred years or so later, when the whirr of one airplane or many as they go over Strafford scarcely causes any one to even look up in the sky! As we stated in last week’s column, the decline of the Spread Eagle Inn as a popular hostelry began with the completion of the old Philadelphia and Columbia Railroad, and as time went on it had practically no patronage except that which was local. However, there was a short period during the Winter when some of the old gaiety was renewed in sleighing parties of young people. Musicians were on hand for the dancers who arrived by the sleighload for open house, which was held all night upon occasion. However, by the latter part of the 1870’s these parties became a thing of the past. As it became less and less of a good investment, the ownership of the Spread Eagle changed hands many times before coming into the possessin of George W. Childs, of Philadelphia, who is said to have bought it to prevent anyone from obtaining a license for the sale of liquor so near is large building operation at nearby Wayne. This was probably in the very early eighties. Soon after acquiring possession of the property, Mr. Childs gave its use to the Lincoln Institute of Philadelphia as a summer home for the large number of Indian girls who were being trained and educated by the institution. Since the managers of the school feared the effect of the hot city on their Indian children they were glad to accept Mr. Childs’ offer. Although no rent was charged, it is said it cost the school more than a thousand dollars to make the hostelry habitable and suited to their use. Soon, almost a hundred girls were established in their new home in what proved a highly successful venture. One of the most interesting events of the Indian girls’ sojourn at the old tavern was an entertainment given on the evening of September 24, 1884, at Wayne Hall. According to Mr. Saehse’s description, as given in his book to which we have made frequent reference, the program “consisted of a series of twenty-two tableaux, illustrative of Longfellow’s beautiful powem of Hiawatha. “The Reverend Joseph L. Miller, chaplain of the institution, read the portion of the poem descriptive of the scenes as presented by the dusky children. There were ten characters represented on the tableaux. Public religious services were also held every Sunday in Wayne Hall by the Institution, when “the choir” music and the responses, according to the ritual of the Protestant Episcopal Church, were entirely rendered by the Indian girls. “As they walked along the stone turnpike, to and from the services, it seemed a far cry from the days when their ancestors roamed this same countryside as they willed among trails of their own making. Visitors at the school included several traveling Indian bands, among them one led by the famous ‘Sitting Bull’, with his band all resplendent in scarlet blankets, leggings and feathers; with faces and hands daubed and streaked with vermillion and chrome yellow”. They must have been a picturesque lot as they sat around the feast prepared for them by the Indian girls. And all of this was happening in Wayne a little more than sixty years ago! 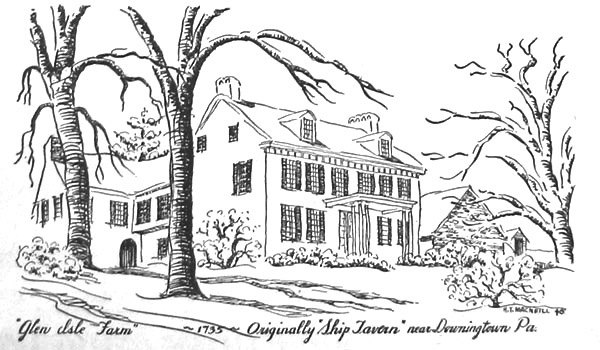 Eventually the old Spread Eagle Tavern was demolished by Mr. Childs, the stones being used in the construction of the Wayne Estate houses, if this writer’s information is correct. According to Elise Lathrop, writing in “Early American Inns and Taverns”, the larger home now known as “Spread Eagle Mansion”, was built somewhere between 1836 and 1846 as a private residence. The building somewhat back of and to the East of the large mansion may have originally been the old stables or some part of them, in Miss Lathrop’s opinion, which she has not been able to verify, however. Any information in regard to the present buildings on the Spread Eagle property will be gratefully received by Mrs. Patterson.